Since the turn of the year, our form has been one of a side in deep trouble. Everybody points to the away form as being the problem but, apart from the demolishing of an admittedly very poor and disillusioned Bolton, since February our home form has been nowhere near good enough either. When it comes to the point where your goalkeeper is clearly timewasting from early on in a home game against bottom of the league Ipswich, it shows just how bad things have got. And bear in mind it was only an injury-time equalizer by Joe Garner that earned us a point against the Tractor Boys. Frankly, we have been so poor. Apart from maybe two or three players – Reece James especially – we have a team full of players who either are just not good enough, or who are not performing and not being motivated by the manager, for whatever reason. Enough has been said about the manager this season, and I am going to refrain from getting into that debate now. However, I have to question his selections and substitutions. For example, last weekend at Bristol, we saw yet another midfield performance from young James, and an outrageous goal from him. Yet in midweek at Hull he was moved back to defence. Recently, he brought Cal Mac on very late in a game, and said afterwards he apologised to Garner and explained he thought Cal could get at them more. The following game, Cal was left out the squad entirely. It didn’t make sense, and it almost feels like it is changes for the sake of it, or the manager is almost managing himself out of this job with the results we are getting. Frustrating? Yes, it is. After the defeat at Hull, where once again we threw at least a point away after leading, we have five games left. The problem is our next two are against Norwich and Leeds, who are both at the top of the league. With us hovering meekly above the bottom three, these two games couldn’t have come at a worse time for us, and could see us finally drop through that trap door into the bottom three. We may not yet be staring relegation down the barrel, but let’s just say the gun is loaded. We are where we are in the league because we let too many goals in, usually soft goals or poor goals from our individual errors and own making, (not many have been 30-yard rockets) and we don’t score enough. We don’t test opposition keepers anywhere near enough, and our final ball and creativity around the opponents box is poor. Put all these things together and we would be struggling in whatever league we were in. We face a summer of changes whatever happens, as big changes are needed whether we stay up, or go down. There’s no question of that. Paul Cook is getting stick he doesn’t deserve. He picks the team and formation etc, but it’s not formations that are costing us, it’s individual errors. Individual errors that have been going on all season. What can Cook do about that? You can’t manage that, they’re basic human errors. A lot of it comes down to luck and, let’s face it, before Nick Powell scored at Hull the other night they’d already hit the post and crossbar, and we could have easily been out of the game before half-time. Confidence is so important in life, more so in football, and watching the interviews after, I’m not sure how the lads pick themselves up. Confidence is at its lowest point all season, but I think we may have to win three out of our last five to stay up. When confidence is this low, how can you see that happening? 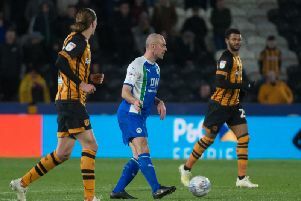 I’ll nail my colours to the mast very early in this piece – I felt Paul Cook and his staff should’ve been shown the door around Christmas, and I still believe with a month left he should go. Half a season is a good sample size to see patterns emerging, and everything that has transpired since has surely to even the most ardent Cook fan been obvious was going to occur. Now I don’t intend this to turn into some personal slanging match towards Cook, because he has my respect for last year and what we achieved. However, in professional sport, there is no room for sentiment or emotion. It’s all about the bottom line of results on a Saturday or midweek night. I’ve always believed the difference between a team’s best and worst performances are down to the coach and captain. They create the culture on and off the field, and senior players help to set the standard. Having a coach complain a captain is being targeted for poor discipline hides the fact Sam Morsy has played a big part in on-field issues. We’ve had excuses for everything this year with very little responsibility taken – injuries, referee input, combinations not familiar with each other. The coach is there to knit the team together, and we’ve only learned Cook can seemingly build a team, start off a game with a plan that can compete, but then fail dismally with the in-game management which brutally highlights his lack of top-level coaching experience. Take Bristol City (and numerous other games) – we were comfortable until they made three subs, we were outplayed until a last throw of the dice, and thankfully we nicked a point. Too often we lack the ability to grind out a result, the away record of losing many points from winning positions shows that. I have believed all season we have a good team in us, being criminally held back by the negativity of Cook’s tactics. But I’m now starting to doubt the players actually have the mental strength for the fight. Blackburn away was where my major doubts about surviving relegation were consolidated. The away record has become a monkey on the back that we can’t shake off. The lack of realism in the months up to Christmas by Cook to accept we had issues is where the damage was done. It allowed poor standards to be accepted. Cook supporters pointed to the injuries, and there is certainly some truth we have suffered with the same injury types for most of the season. I put this firmly at the door of those in charge of training and injury management. Luck plays a part, but the soft-tissue injuries we have suffered this year should mean we have a full review of the off-field structure. Finally onto the last five games of the season. I would love another coach to come in, have the Norwich and Leeds games as free hits, and then focus on the final three matches. We did it with Steve Bruce in 2001 and it almost played out perfectly. This group of players, with a more positive approach from a new voice, would work wonders. What a challenge for the players to make a success out of what’s left of the season. They should be excited, not fearful, to make a difference and prove that September wasn’t a fluke. I don’t believe we can survive under Cook, but it would be a good sign of intent from the owners to make a brave decision and save us before it’s too late.